Last year I travelled by motorbike from Australia to the Netherlands, not something many single women find themselves doing. There are a few countries along the way that most people, both men and women, would advise you to avoid. One of these is Pakistan. But with the high costs of riding through China, that wasn’t an option for me. If I’d taken a more southern route, I’d have been sinking my two wheels in the Arabian Sea. 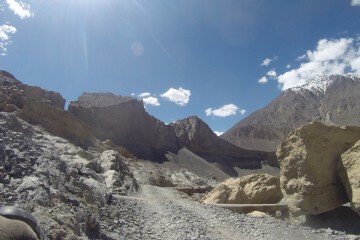 So, to avoid loading my bike onto an airplane, I rode through Pakistan. Contrary to popular opinion, Pakistan is actually an amazingly welcoming country with super friendly people and mind-blowing nature. Without exception, when asked what is the most beautiful part of their country, Pakistanis will tell you it is the mountainous North. The Karakoram Highway serves as the meandering spine for the little international tourism Pakistan still gets. This road leads from the flat, dry lowlands, just north of the capital Islamabad, to the arid grey mountains of the highest border crossing in the world, at the Khunjerab Pass. On my motorbike, I happily left the crowds of Islamabad and headed north. Somewhere along the way, I would be meeting up with other motorcyclists. Since Pakistan is not a holiday destination your mother will quickly approve of, only rare, daring travellers are to be found on your way. 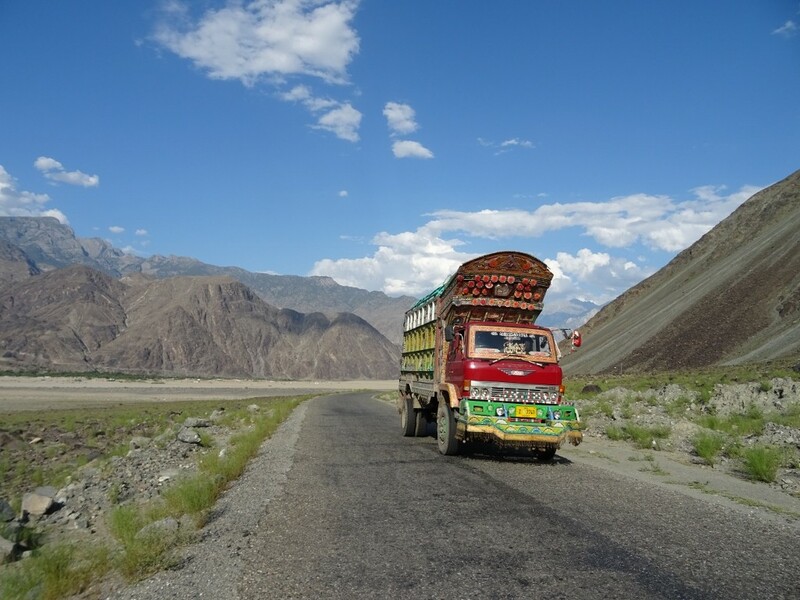 Once the Karakoram Highway started to climb, I was grateful to have been forced to travel through this country. The natural beauty is incomparable. 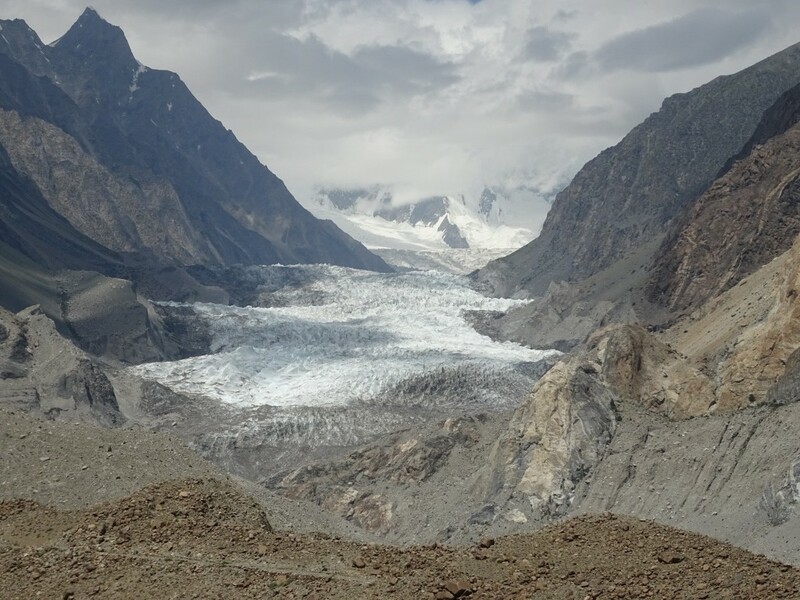 It is the gateway to incredible mountains such as K2, stunning valleys, multiple white-grey glaciers and intensely coloured glacial lakes. When I met with the other riders we visited the Naltar Valley. Over a narrow, rocky and muddy trail, through several water crossings, we eventually reached two stunning glacial lakes, one blue, one green. Both lakes were wrapped by cold grey mountains and had a perfect patch of green grass on the other side, on which I could relax and enjoy their beauty. That night we found a basic campsite, with no electricity. In the dark, looking at the stars, we shared stories of our individual trips and planned to visit a glacier the next day. In the morning we walked to a viewpoint. Starting high on our far right, stretching until right beneath the rock we were standing, was an immense glacier. The endless cascading white ice was contrasted by an intense blue sky. We were all taken by the snow-capped beauty of this region. 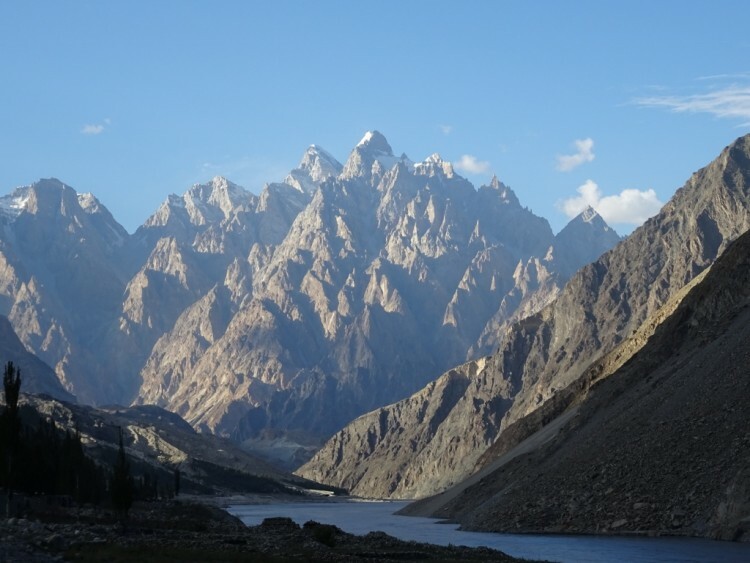 Although the Karakoram Highway leads towards some of the highest mountains in the world, most of the actual route is located at a ‘mere’ 2000 meters. 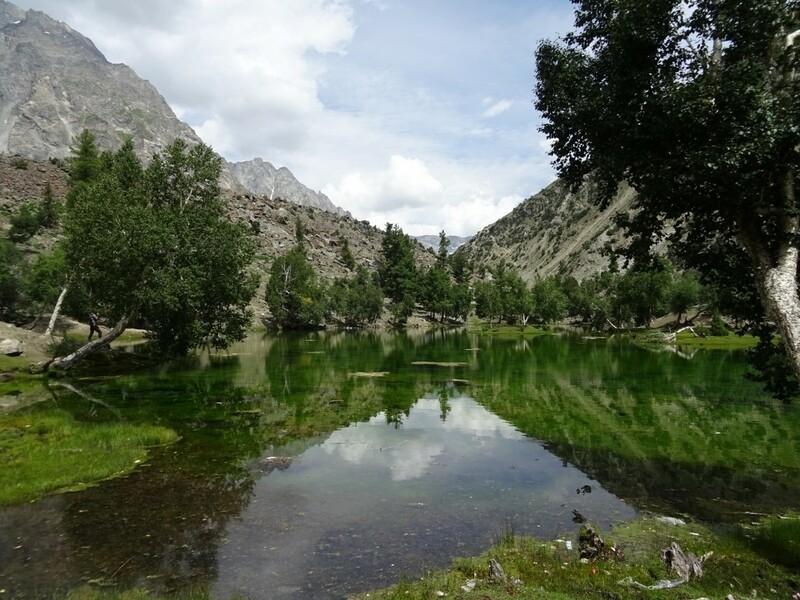 At this altitude, it runs along the entire length of the fertile green Hunza Valley. Here, the trees were heavy with an abundance of fruit. Walking past an orchard, the local boys gestured for us to join them. One climbed a tree and vigorously shook its branches. A multitude of juicy ripe apricots fell on the ground. They were washed in a nearby stream. We sat with the boys and enjoyed the most delicious fruits that had ever reached my taste buds. Most of these apricots are dried and sold, so we bought a bag for our journey ahead. The Hunza Valley is populated by the Hunza people who, some claim, are descendants of the soldiers of Alexander the Great. They are the best educated and the most liberal people of the entire country. They also have an eye for commerce. 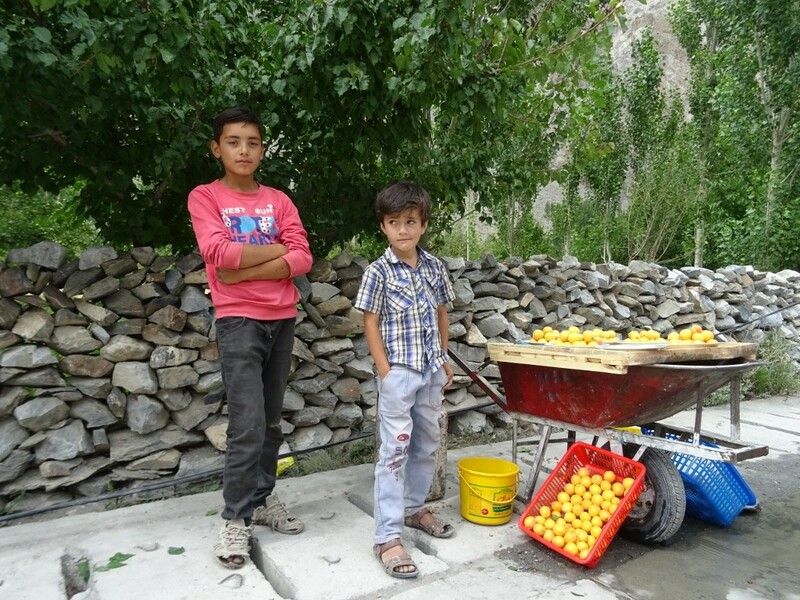 In these summer months, along the highway, kids sell fruit from their gardens to the passing tourists, who are mainly Pakistanis. They make a little pocket money while providing a great service. That night we camped near a lake. While we were setting up our tents, two boys arrived. They had a hat full of apricots. Shyly they approached us, and one apricot at a time kept going around until their hat was empty. When they saw us spitting out the pits, they gestured wildly that this was totally inappropriate. Instead, they picked up the pits and smashed them with a rock to expose a small nut inside. For a week, I travelled through this jaw-dropping landscape. I felt perfectly safe and more than welcome. My bike allowed me the freedom to explore the landscape at my own pace, camp at breathtaking spots and easily connect with the friendly locals. It was an experience I wouldn’t want to have missed! Amazing journey! Thanks for sharing it with me.